My daughter couldn't love animals more and as a total animal lover myself, I always enjoy finding toys which foster creativity as well as a sensitivity towards animals. Of course, every mom would love for their child to become a doctor too, since it's a highly prestigious career that helps people and/or animals. Now, B. 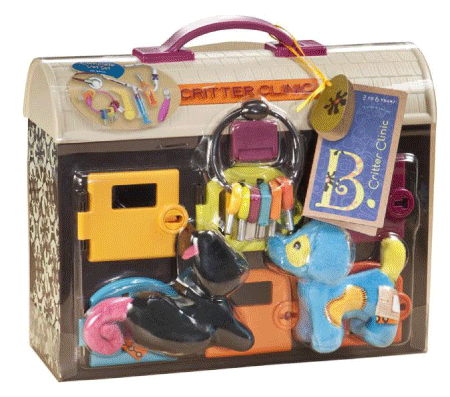 Toys has found a way to combine all of these interests into one super fun toy, the Critter Clinic. Keep reading to learn much more! I reviewed the Critter Clinic from B. Toys, which retails for $44.99, but is currently on sale for $32.97. One of the neatest things about the Critter Clinic is how there is truly a place for everything and it is ready for fun on the go. The soft rubber handle is great for carrying this toy from room to room or even from house to house. 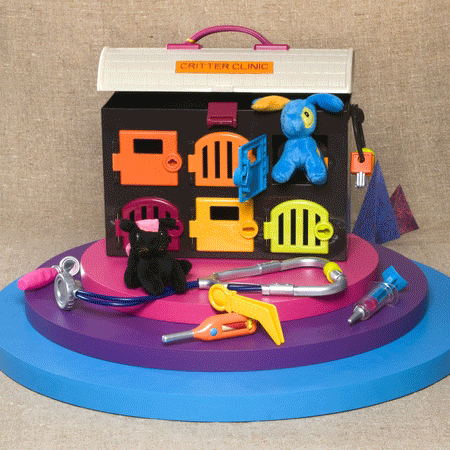 All five of the vet's medical tools store neatly inside the Critter Clinic and the keyring of color-coded keys hang on the side of the toy from the small hook located there. I love toys that require a ton of imagination and creativity from children and I could easily see how the Critter Clinic would have your child playing doctor all day long. I also think that playing with this toy's syringe and thermometer will help a child realize that these are just medical tools and nothing to be afraid of once their own turn at the doctor's office arrives. The small plush critters are super cute and just the right size for examining. The color-coded keys are also a wonderful addition to the Critter Clinic, for they will help young children learn their colors as well as help them master how to manipulate small objects with their hands. If you are looking for an extremely fun and well-designed toy which will foster creative play and help your child become more familiar with being a doctor, then I highly recommend purchasing the Critter Clinic from B. Toys. Your child will learn how to properly use certain medical tools, identify colors and shapes, and develop compassion for other living things while playing with this toy. When "Meow" turns into "Me-Ouch", your child will be ready to help, with the Critter Clinic! Disclosure: I received the Critter Clinic from B. Toys in order to facilitate my review. No other compensation was received. This product review is based on my own personal experiences with this item and is completely honest and objective.